The poor old washing machine seems to have been going all day. I think Jan must have done at least four loads. Fortunately it has been a clear but brisk and slightly windy day which has enabled Jan to dry everything using the rotary clothes line on the stern. No doubt there is more to be done before she is satisfied everything is up to date in preparation for winter. Now we’re on shore power the ‘crock-pot’ has been taken from deep storage and I note a jam topped steamed pudding has been made for tonight’s dessert. I love winter!! I recovered the small, 12v dehumidifier from the base of the wet locker and plugged it in… Nothing! A further 30 minutes were then spend disassembling it to remove two winters of accumulated dust… Still nothing! The problem was the fan… it wasn’t spinning. After working on it for a few minutes I managed to get the blades to spin freely before reassembling it. Everything is now working and Jan has placed the dehumidifier in the bedroom in the hope she won’t get dripped on during the night. Sleeping on the passageway side has at least one disadvantage! 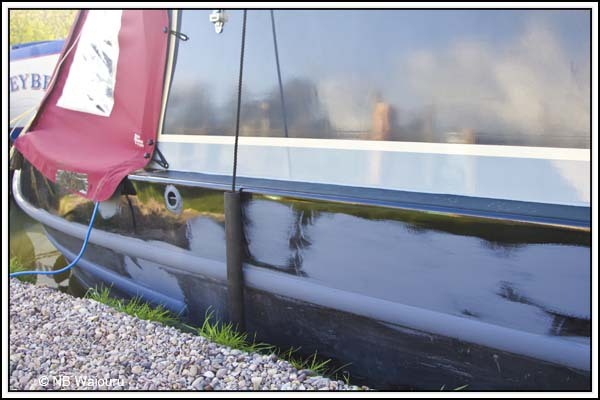 The next task was to continue with the work on the scars, scratches and rust below the port (left) gunwales. I had rubbed the rust down yesterday but it rained overnight and the rust was back! <grrrr>. However it wasn’t that difficult to remove and I then applied a coat of primer to the bare metal and scratches. The latter was done more to “build-up” the paint in preparation for the top coats. I’ve already decided to follow the advice of Jo (nb Hadar). 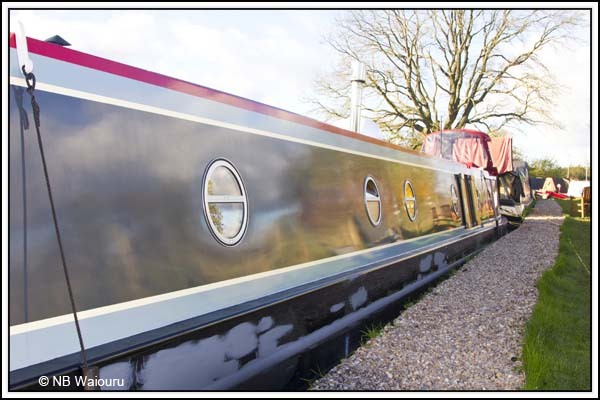 When our existing supply of black gloss paint has been used I’ll paint below the gunwales in matt black. It will make the job much easier. By the time the painting had been completed I found myself enthusiastic but cold. So I stupidly decided to polish the port side. It certainly warmed me up but what I really need is Paul (nb The Manly Ferry) and his magic polishing machine. 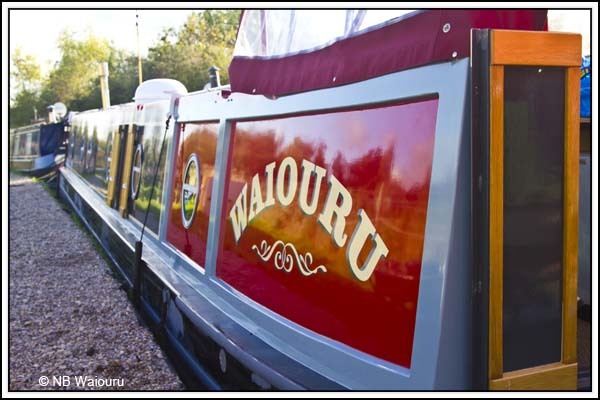 I suspect the lack of ‘shine’ is due to too much elbow grease smudging the paintwork! There are many outstanding small jobs on the “to do” list so we’re not going to be idle. In the afternoon we received some mail post. A large cardboard parcel, about the size of four hardback books. However it was very light and felt empty. Inside was a small printed circuit board I’d ordered. It was the size of a matchbox and the thickness of two credit cards. Why the huge box for something so small? Perhaps I shouldn’t be surprised. It was ordered online from BT and I found their website frustrating. It’s the only website I’ve visited to date where the provision of a home (landline) telephone number was a mandatory field. In the end I randomly chose a number just to be able to complete the transaction. Tomorrows local weather forecast is for rain which will preclude any continuation of the painting. However there are a number of other undercover tasks that can be completed instead.